Context: Myofibroblasts (MFs) are fibroblasts with smooth muscle-like features characterized by the presence of a contractile apparatus. Alpha-smooth muscle actin (α-SMA) is the actin isoform that predominates within vascular smooth muscle cells and plays an important role in fibrogenesis. MFs are metabolically and morphologically distinctive fibroblasts expressing α-SMA, and their activation plays a key role in development of the fibrotic response. Aims and Objectives: The aim of this study is to demonstrate the frequency, distribution and expression of α-SMA-positive MFs in odontogenic keratocyst (OKC), dentigerous cyst (DC) and ameloblastoma and correlate it to their aggressive biological behavior. Settings and Design: A retrospective study of 45 diagnosed cases, which includes 15 cases of OKC, 15 cases of DC and 15 cases of ameloblastoma, was undertaken to demonstrate expression of α-SMA retrieved from archives of our department. Materials and Methods: α-SMA mouse anti-human antibody and horseradish peroxidase detection system were used in this study. Statistical Analysis: Descriptive statistical analysis and ANOVA test were used for statistical analysis. Results: The difference in mean α-SMA count was found to be statistically significant between ameloblastoma and DC group (P < 0.001) as well as OKC and DC group (P < 0.001). No significant difference is observed between ameloblastoma and OKC group (P > 0.05). Results showed that mean number of stromal MFs in OKC and ameloblastoma were significantly higher than DC. Conclusion: The present study has shown that the mean number of MFs was higher in OKC and ameloblastoma, while the mean number of MFs in DC was quite low and significantly different from that of ameloblastoma and OKC. Myofibroblasts (MFs) are fibroblasts with smooth muscle-like features characterized by the presence of a contractile apparatus. Normally, they are found in healing wounds, lymph nodes, blood vessels, uterine submucosa, intestinal villous core and lung septa and in pathologic conditions (reactive lesions, benign tumors, locally aggressive (borderline) fibromatoses and sarcomas showing MF differentiation). MF also appears in hypertrophic scars, cirrhosis of the liver and fibrosis of the kidney. Many pathologic conditions of the oral mucosa and the jawbones contain MF, including nodular fasciitis, giant cell fibroma, peripheral giant cell granuloma and cyclosporin-A-induced gingival hyperplasia. Stromal MFs have the potential to facilitate progression of neoplastic epithelial lesions that could contribute to their biological behavior. Stromal MFs have been implicated in the biological behavior of cysts and tumors. The transforming growth factor beta-1 (TGF-β1) cytokine plays a role in transdifferentiation of fibroblasts into MFs. 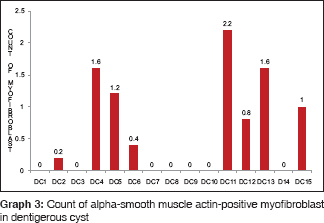 Most of the MFs express alpha-smooth muscle actin (α-SMA), which is the actin isoform typically found in vascular smooth muscle cells and coordinately regulated by TGF-β1. α-SMA is the actin isoform that predominates within vascular smooth muscle cells and plays an important role in fibrogenesis. This descriptive study was carried out on tissue sections obtained from diagnosed cases of odontogenic cyst and tumors, retrieved from the archives of our department. In the present study, a total of 45 previously histologically diagnosed, paraffin-embedded tissue blocks including 15 cases of odontogenic keratocyst (OKC), 15 cases of dentigerous cyst (DC) and 15 cases of ameloblastoma and 10 cases of squamous cell carcinoma (SCC) were selected and studied for the expression of α-SMA, which is a marker for stromal MFs. SCC was taken to serve as an external positive control. α-SMA-positive cells within blood vessel walls served as internal positive control for the specificity of the stain. 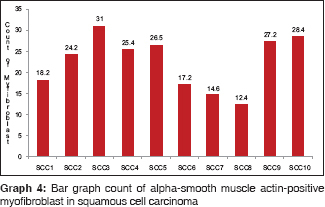 MF frequency was assessed as the number of α-SMA-positive stromal cells in 5 high-power fields, presented as the mean number of positive cells per field. 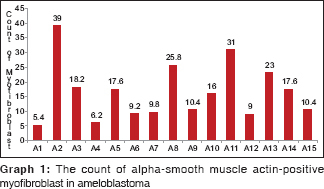 Differences in the mean number of α-SMA-positive cells per field among all the three types of lesions (OKC, DC and ameloblastoma) were analyzed using one-way ANOVA test. In odontogenic cyst, the cells were oriented parallel and were presented adjacent to the lining epithelium [Figure 1], [Figure 2], [Figure 3]. Ameloblastoma demonstrated the presence of MFs adjacent to the odontogenic islands similar to that seen in SCC, where these cells were seen in concentric layers surrounding the dysplastic epithelial islands present in the connective tissue [Figure 4] and [Figure 5]. 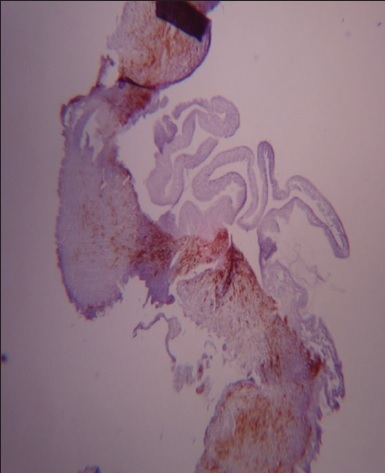 Deeper connective tissue showed haphazardly arranged α-SMA-positive cells. 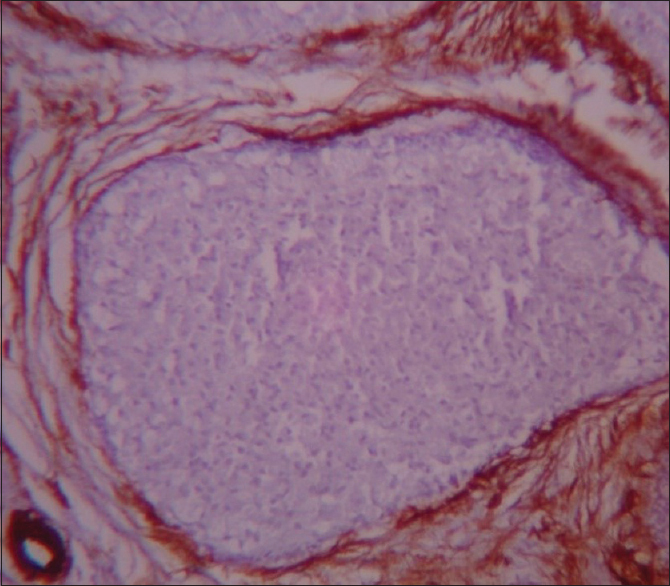 Sections of SCC showed that malignant islands were surrounded by abundant SMA-positive stromal cells. Cases of SCC were used as an external control. Descriptive statistical analysis has been carried out in the present study. Results on continuous measurements are presented on mean ± standard deviation (minimum-maximum) and results on categorical measurements are presented in number (%). Significance is assessed at 5% level of significance. ANOVA test has been used to find the significance of study parameters on categorical scale between two or more groups. 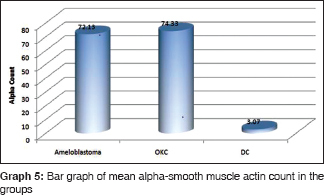 Higher mean α-SMA count is recorded in OKC group followed by ameloblastoma and DC group, respectively [Graph 1],[Graph 2],[Graph 3]. The difference in mean α-SMA count between the groups is found to be statistically significant (P< 0.001) [Graph 4] and [Graph 5]. The difference in mean α-SMA count was found to be statistically significant between ameloblastoma and DC group (P < 0.001) as well as OKC and DC group (P< 0.001). No significants difference is observed between ameloblastoma and OKC group (P > 0.05) [Table 1] and [Table 2]. The purpose of this study was to demonstrate the expression of α-SMA in OKC, DC and ameloblastoma, with a view to understanding its role in tumorigenesis. Tooth formation is an important event in which the matrix components play a crucial function in the histodifferentiation and morphodifferentiation processes. After complete tooth development, epithelial remains may continue inactive for an undetermined period. Nonetheless, under the influence of unknown stimuli, it can initiate the related odontogenic tumors and cysts. As morphogenesis and cell differentiation in the developing tooth are controlled by a series of reciprocal interactions between the epithelial and mesenchymal tissues, it has been pointed out that the development of odontogenic tumors and cysts arising from tissues' remains of odontogenesis is also dependent on these interactions. The jaws are host to a wide variety of cysts and neoplasms, due in large part to the tissues involved in tooth formation. Odontogenic cysts arise from the components of odontogenic apparatus such as dental lamina, enamel organ, or its remnants either during or after formation of the tooth. Epithelial proliferations play a significant role in the behavior of odontogenic lesions. Proliferation activity is an important predictor of biologic behavior of pathologic condition and as a potential guide for therapy. MFs are fibroblasts with smooth muscle-like features characterized by the presence of a contractile apparatus. The presence of stromal MFs has been linked to the biological behavior of both benign and malignant tumors. Lombardi and Morganconfirmed the presence of MF in odontogenic cyst walls and suggested that they might be part of a homeostatic response to the distension caused by cyst enlargement. The presence of MF in the stroma of DC and OKC may be related to cystic expansion. Vered et al. 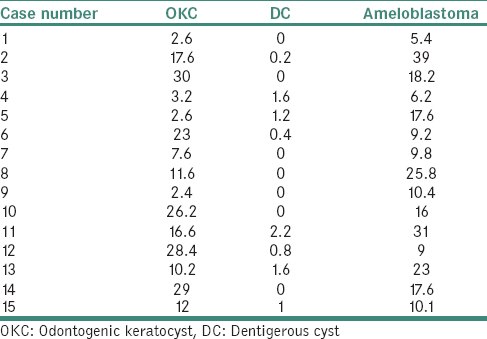 found that among the odontogenic cysts, OKC had the highest mean number of MF and DC had the lowest. Furthermore, among the odontogenic tumor, MF in ameloblastoma was significantly higher than unicystic ameloblastoma and concluded that MFs in the stroma of odontogenic cysts and tumors can contribute to variations in the biological behavior of lesions. Mashhadiabbas et al. demonstrated the presence of MF in stroma of the odontogenic lesions but did not report any relationship with the lesions aggressive behavior. Nonaka et al. suggested that differences in the biological behavior of syndromic OKC and nonsyndromic OKC may not be related to the expression of Receptor activated kappa ligand (RANKL) and Orthopantamograph (OPG), the RANKL/OPG ratio, the angiogenic index, or the number of MFs in these lesions. Rothouse et al. for the first time described the presence of MFs in the stromal component with a unique and previously unreported demonstration of intracellular septate junctions. Fregnani et al. suggested that abundant presence of MFs and expression of matrix metalloproteinase-2 (MMP-2) in solid ameloblastomas may be associated with a more aggressive infiltrative behavior. The abundant presence of MF in the stroma of the tumors and expression of MMP-2 in the neoplastic or stromal cells was significantly correlated with rupture of the osseous cortical, which has been considered an important prognostic marker of ameloblastoma aggressiveness. Hence, the role of MF has yet not been established in the odontogenic lesions, as there still exists a divergence of opinion. Further investigation and studies in this field with a note on the treatment prospective will help in establishing the role of MFs in the biological behavior of odontogenic lesions. We can conclude that the treatment modalities for these odontogenic lesions should target concomitantly the neoplastic epithelium and associated stroma, especially MFs, which could result in reduction of the extent of lesion and thus aids in better surgical management and postoperative morbidity because curative surgery of particularly aggressive odontogenic lesions could occasionally result in significant functional, esthetic and psychological damage. 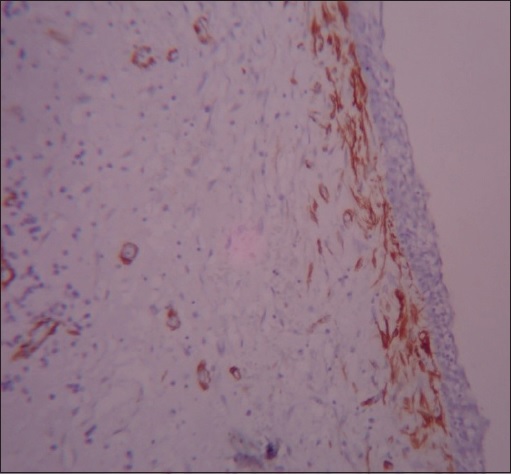 Vered M, Shohat I, Buchner A, Dayan D. Myofibroblasts in stroma of odontogenic cysts and tumors can contribute to variations in the biological behavior of lesions. Oral Oncol 2005;41:1028-33. Cherng S, Younge J, Ma H. Alpha-smooth muscle actin (α-sma). J Am Sci 2008;4:1545-1003.
de Oliveira MD, de Miranda JL, de Amorim RF, de Souza LB, de Almeida Freitas R. Tenascin and fibronectin expression in odontogenic cysts. J Oral Pathol Med 2004;33:354-9. Regezi JA. Odontogenic cysts, odontogenic tumors, fibroosseous, and giant cell lesions of the jaws. Mod Pathol 2002;15:331-41. Tiecke R, Stuteville OH, Calandra JC. Pathologic Physiology of Oral Disease. St. Loulis: The C V Mosby Company; 1959. Sudiono J, Zain RB. 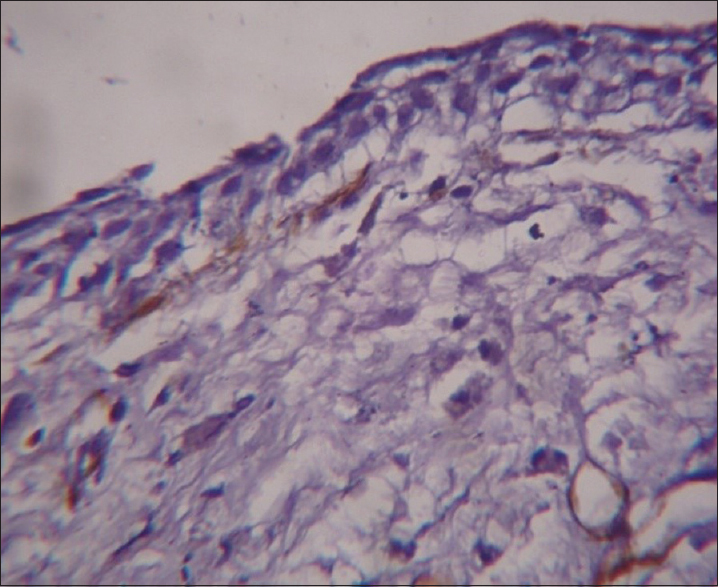 Pcna expression in epithelial linings of odontogenic cysts. Annal Dent Univ Malaya 2003;10:1-5. Lombardi T, Morgan PR. 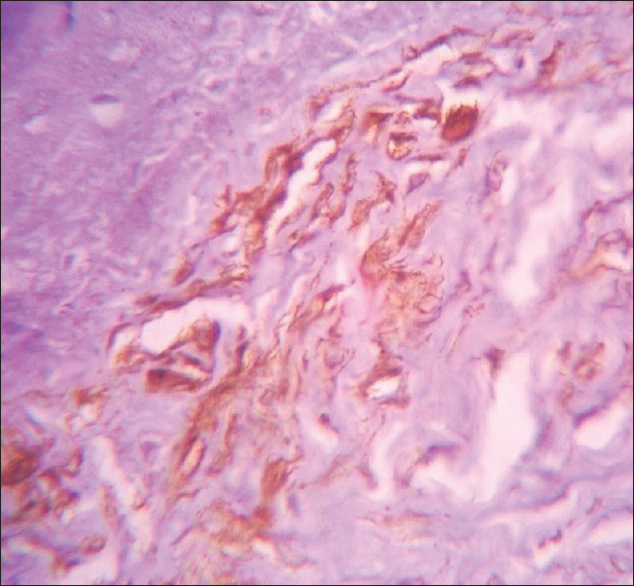 Immunohistochemical characterisation of odontogenic cysts with mesenchymal and myofilament markers. J Oral Pathol Med 1995;24:170-6. Mashhadiabbas F, Atarbashi Moghadam S, Moshref M, Elahi M. Immunohistochemical detection and ultrastructure of myofibroblasts in the stroma of odontogenic cysts and ameloblastoma. Iran Red Crescent Med J 2010;12:453-7. Nonaka CF, Cavalcante RB, Nogueira RL, de Souza LB, Pinto LP. 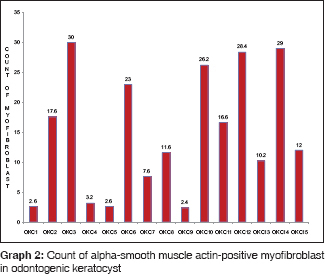 Immunohistochemical analysis of bone resorption regulators (RANKL and OPG), angiogenic index, and myofibroblasts in syndrome and non-syndrome odontogenic keratocysts. Arch Oral Biol 2012;57:230-7. Rothouse LS, Majack RA, Fay JT. An ameloblastoma with myofibroblasts and intracellular septate junctions. Cancer 1980;45:2858-63. Fregnani ER, Sobral LM, Alves FA, Soares FA, Kowalski LP, Coletta RD, et al. Presence of myofibroblasts and expression of matrix metalloproteinase-2 (MMP-2) in ameloblastomas correlate with rupture of the osseous cortical. Pathol Oncol Res 2009;15:231-40.